An Abertay University graduate games studio has launched a Kickstarter funding bid to market their unique hybrid tabletop game. 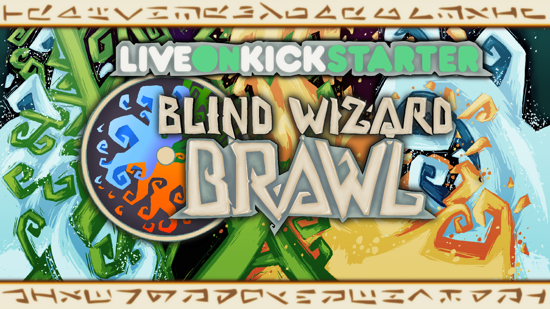 Wrench Games are looking for funding to push Blind Wizard Brawl, a real world and digital game in which players create spells and bluff their way to victory using both cards and a mobile app. The concept was initially created by Computer Arts graduate JL Brady for an Abertay honours project investigating hybridised games. As Wrench evolved, the idea was taken out of the classroom and developed by the team during their final year. The team originally came together during a 3rd year Professional Project module which sees Abertay students from across disciplines come together to work on a live brief. Other members of Wrench include Game Design and Production Management graduate Nik Balson; Computer Games Application Development graduate Stuart McKie; Computer Games Technology graduate Peter Black and Computer Arts graduate Alissa Dolan. To bring the game to market the team are using Kickstarter, a crowdfunding platform that helps to get creative projects off the ground. Nik said: “Abertay has been fundamental to developing the game and bringing it to where it is today. “Coming to Abertay and seeing how many successful games studios the University has spawned or contributed to was the ideal motivation to succeed. “Our successful funding will go towards completing this game and making it the best product possible for backers and future players. Wrench have already reached 69% of their funding goal and for every target reached they plan to release new characters and features of the game. Abertay is the number one university in Europe for undergraduate computer games degrees and in the world top 10 for postgraduate degrees. Since 1888, Abertay has been preparing students for the world of work and more than 92% of our graduates go into employment or further study within six months of graduation. We were the first in the world to offer degrees in computer games and also in ethical hacking, where we uniquely train students in offensive security. Made up of five schools – Design and Informatics; Science, Engineering and Technology; Dundee Business School; Social and Health Sciences and the Graduate School - Abertay is home to world-leading research teams with pioneering initiatives across a host of topics.